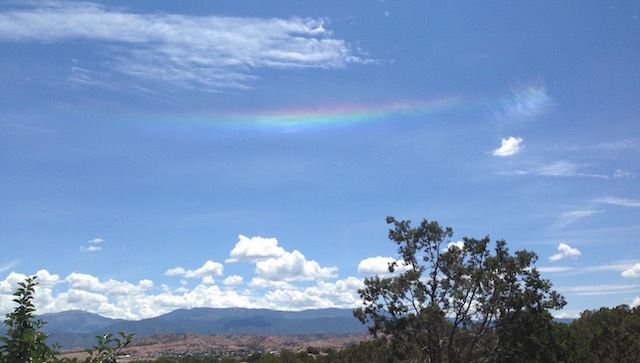 We’d never seen a horizontal, smiling rainbow, but here it is beaming over CI. Addition to Advisory Committee: Barbara Cox and Rod Kulbach came for a week’s visit to introduce neurologist/psychiatrist Geert Mayer to CI. 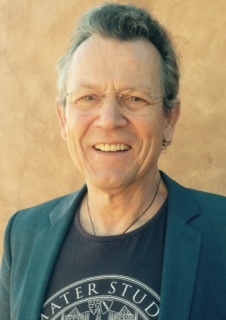 After just a few sessions in the kiva, Geert had this to say: “The wake, non-REM and REM states are characterized by defined Networks within the brain. They receive Input from the Environment to which they can react depending on the activated Network. With each Change of the wake-sleep state brain Centers that have been activated Close down. States of Trance as in the Kiva or in “lucid dreaming” may allow us to voluntarily sneak into Centers that normally would have been shut off and allow us new mental and physical experiences. Geert, who heads Germany’s Hephata Klinik, serves as Associate Professor of Neurology at Philipps University, and lectures at conferences all over the world on the brain in sleep and dreaming, graciously sat down for a couple of hours of interviews on his expertise as it relates to CI’s work, particularly the experience of trance as a “waking dream” which especially intrigued him due to his interest in lucid dreaming states. We got out and about as well — Barbara, a cause-oriented, fine arts photography agent, took us to meet her colleagues at Santa Fe’s Photo-Eye Bookstore and Gallery. We visited several Canyon Road galleries, as well as her favorite artist at Santa Clara pueblo. 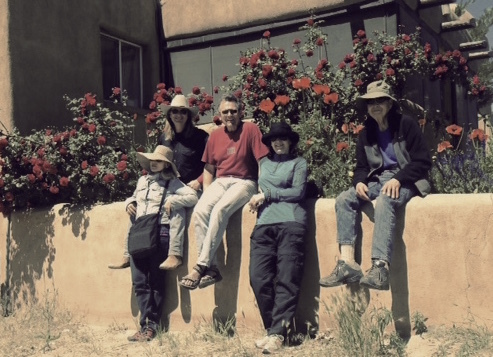 We hiked and climbed the long ladders of Bandolier’s cliff dwelling, toured the Georgia OKeefe Museum, and saw the house and Ghost Ranch in Abiquiu. Maria Decsy emailed that she had been trying to get to a workshop all summer but couldn’t get her schedule to line up with ours. She teaches world religion in a small East Coast college, and had long been interested in Dr. Goodman’s work. Here she was in Santa Fe on other business, could she stop by to meet us? 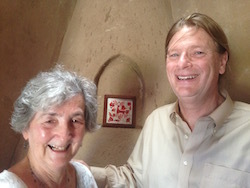 During the tour of CI, Maria was delighted with the red and white ceramic tile that graces the fireplace in the casita. “I’m Hungarian, like Felicitas,” she explained. “This white stag is the mythical center to the story of how two tribes migrated into the area that would be their new homeland, it’s the whole story of Hungary’s origins. Mutual friends had been suggested to me that I needed to meet Merle Lefkoff, and to her that she needed to see CI, since she too lives both in Santa Fe and Friday Harbor. Well, that’s not all we had in common. 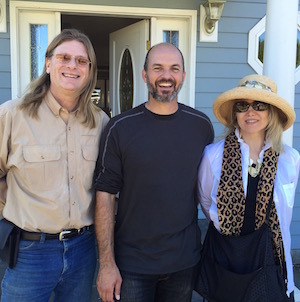 We had a delightful visit and found much in common on a shared philosophy. 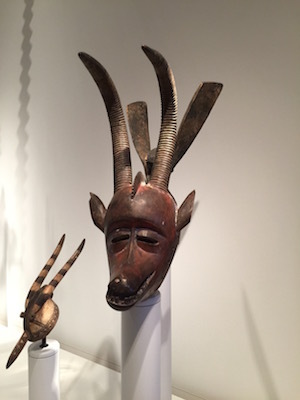 We visited with ethnologist Bruce Bernstein, who mentioned that a fragment of the bell that was hung at the Cuyamungue ancestral village was in the Museum of Indian Arts & Culture. We had missed that on our earlier visits, so we went back to take another look. Sure enough, we found it. Cast around 1600, this was gift from the King of Spain to the colony of “another Mexico.” Cuyamungue was one of the several stops on the priest’s rounds of the communities within his parish. 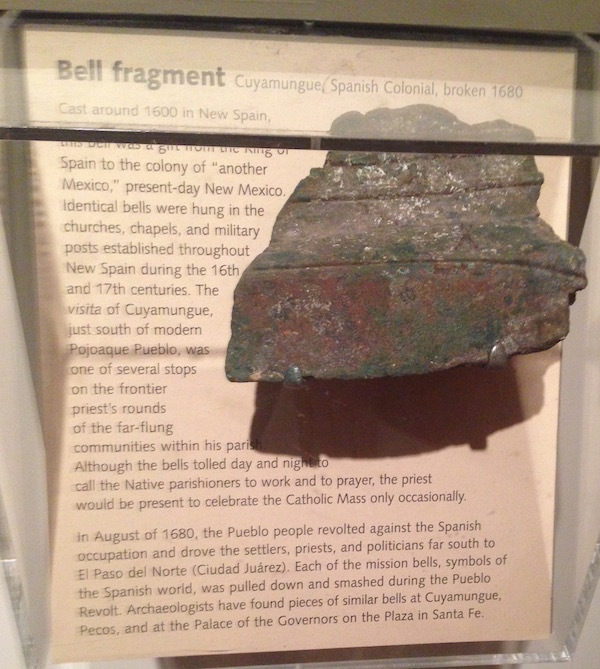 In August of 1680 the Pueblo people revolted against the Spanish occupation and the bell was pulled down and smashed. Photo of Cuyamungue bell fragment. 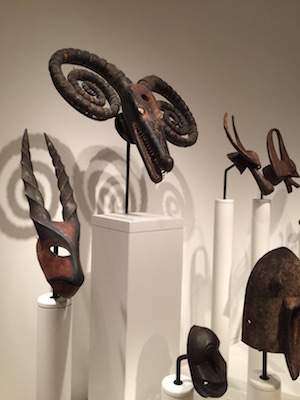 Paul and I saw an exhibit on traditional masks and a modern art interpretation — at the Seattle Art Museum. Report to follow. 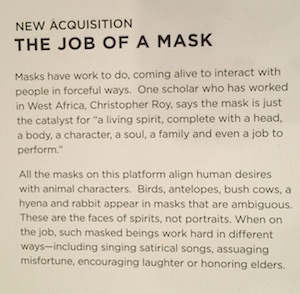 A mask was central to the performance art in progress that my sister Kim invited us to attend as she photographed Ian Boynton. 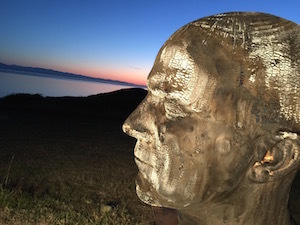 The new director of Friday Harbor’s Island Museum of Art, Ian explained his vision of art as a process interacting with its environment. “We live in relationship, not in a place,” he said. 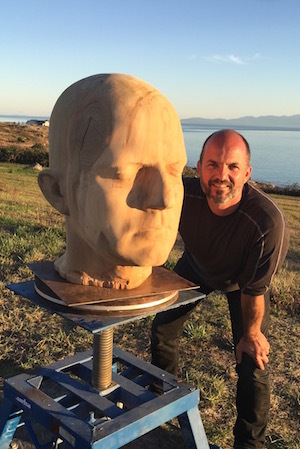 Ian commissioned a mold made of his head, so he could have a robotic arm carve a perfect self portrait out of a huge stump from the Olympic peninsula. Setting the head on a wheeled cart to gaze across the waters of Haro Straight , he made of ritual of burning the mask’s first layer — the wood was still wet and it took a blow torch to blacken it — to initiate a ….